Phoenix are done for the season. Tonight they will play a meaningless game against one time rivals San Antonio. The Spurs are the number one seed for the playoffs. The Phoenix Suns are the most dreaded 9th spot. The best of the worst. The Suns have seen a host of players come and go in recent years. Shawn Marion, Amare Stoudamire, Raja Bell, Goran Dragic, Jason Richardson, Boris Diaw to name a few. The one constant was Steve Nash. The MVP point guard has stayed loyal to the Suns in the midst of good players leaving and traded away. Now this time Steve is a free agent. And his loyalty has been surely tested. When you don’t back up a person with good financial and business decisions you almost force their hand. 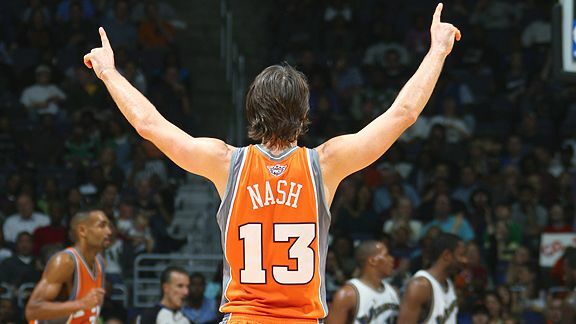 I hope Steve Nash signs a new deal with the Suns. But I totally understand if he signs with a team with more ambition. You would struggle to find one with less.